Throughout 2018, we are excited to partner with our friends at The Outside Project to highlight the travel photography of their globe-trotting ambassadors, otherwise known as Explorers. The impressive work of these photographers is often featured on The Outside Project’s Instagram account, providing daily wanderlust to their 136,000 followers. Do you want to be featured on the Resource Travel Instagram? Make sure to use the hashtag #ResourceTravel when posting your adventures! And of course, always share your love for nature and adventure using the hashtag #Outside_Project to be featured on their well-curated Instagram account. Check out the January Photos of the Month from The Outside Project explorers! While on a trip to Dubai to visit my brother and his family, we decided to meet up with a friend and take a drive out into the desert. On the baron desert drive, we spotted a group of cars parked on the side of the main road, watching what we thought was a batch of small toy planes flying above them. We pulled off to see what they were doing, and saw that it wasn’t RC planes, but rather, they were training their falcons over some abandoned roads in the desert. 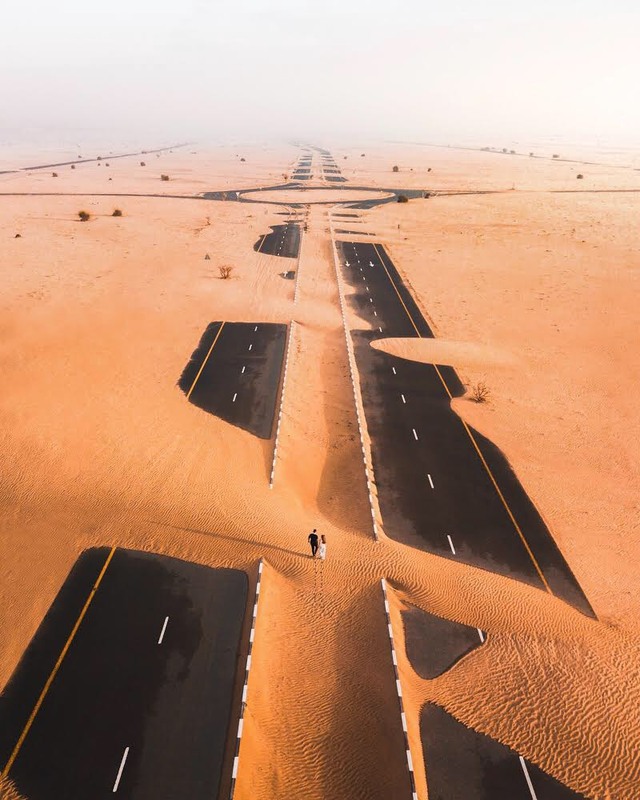 Anxious to see this impressive scene from above, I quickly launched my drone and was amazed when I saw these roads on the screen, stretching out in all directions in the distance through the vast sand dunes that Dubai is so well known for. If I had to give any advice to aspiring photographers, it is simply this. Practice. It took me months and months of shooting every day to get to where I am today, and you’ll only improve with practice. Also focus on composition when taking a photo, and always be on the lookout for inspiration.It can come in the most unlikely places, such as the middle of a road buried in sand in the desert. I had gotten up very early to shoot an entirely different scene at Glacier Point in California’s Yosemite National Park. But as luck would have it, I ran into Chris Burkard and Ryan Robinson, who would become the subject of this photo. Not only did I come home with a fantastic shot, but I also came home with a memory that I won’t ever forget. My advice to aspiring photographers is this. Good photos usually require a little luck, and just as importantly they require opportunity. But most importantly, they require initiative. And you need to reverse that order…take initiative to create the opportunity, and then hope for just a little bit of luck. In 2017 I traveled quite a bit and I feel I took the best photos I’ve ever taken. But my most memorable moment happened while standing atop the Arc De Triomph in Paris. We had arrived at the top and waited for the sun to start to set. When it did, I didn’t imagine the sky to explode with vibrant colors like it did. 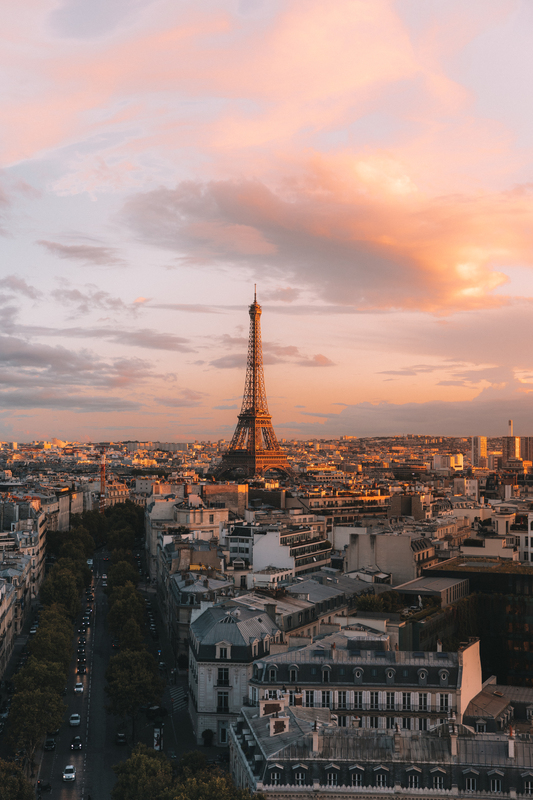 After snapping some photographs, I put my camera down and the sun slowly faded away as the Eiffel Tower started to light up. I can’t wait to capture more memories like this in 2018. My best piece of advice when taking photos is to shoot at angles that you really haven’t seen before or opposite of what your friends are doing. This will allow you to catch your own unique perspective on a subject new or old. I am a 27-year old Belgian that decided to move a year ago to Vancouver to be with my Canadian girlfriend. This picture is really important to me because it was taken at a moment where I was really having doubts regarding my photography. At the time, I was not inspired and really disappointed by the feedback and the engagement I was getting. That day I decided to go out, shoot, enjoy my new outdoor playground and not harp on the negatives. I just wanted to have a good time and focus on what I love, taking pictures of wildlife. It ended up being the best hike and when I came face to face with this beautiful bear, one of my most memorable best encounters ever. If I have one advice to give to aspiring photographers is that it is normal to doubt yourself from time to time. It is part of the process, but never ever give up and fight through it, at the end it’s always worth it! Gokyo sits at 15,500 ft in the Solukhumbu district of the Himalayas. Surrounded on all sides by 20,000 foot mountains, the town tucks in next to the Ngozumpa glacier. 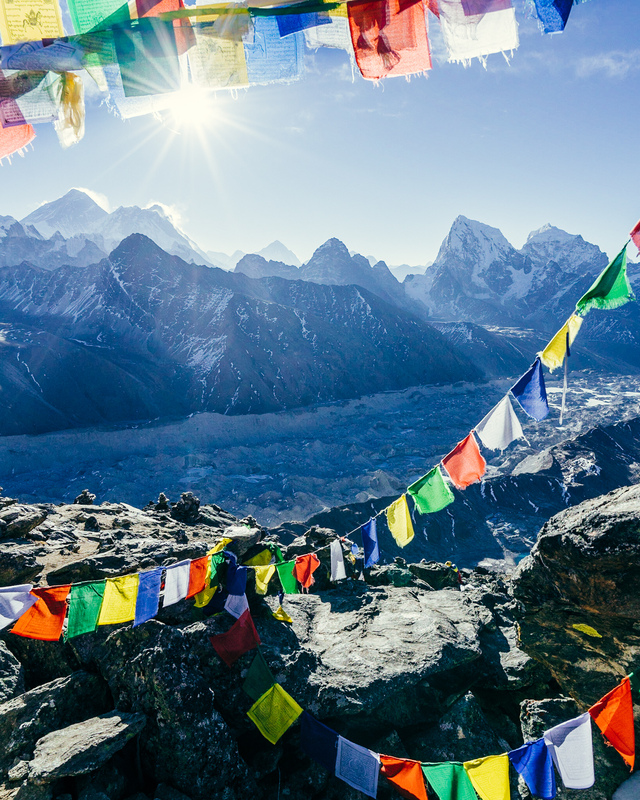 Summiting Gokyo Ri before sunrise allows the spectacular experience of watching the sun rise over Mt. Everest 14 miles to the east. The climb is steep, and the thin air at this elevation makes the hike extremely challenging, but when the sun begins to warm the air and the breath returns to your lungs, there is hardly words to describe the view.